It’s almost the end of the year and that means people are scrounging around tightening loose ends, thinking about new year’s resolutions, setting new goals and just probably sitting back! 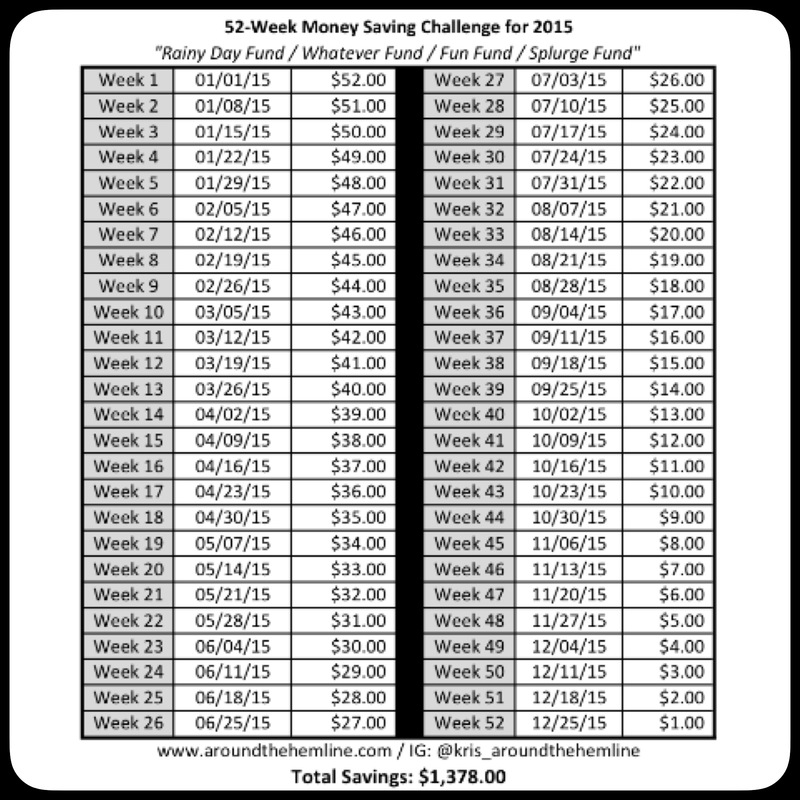 Either way, I wanted to share this really simple “challenge” to save up a nice “Fun Fund” stash for 2015. I did this last year (found the idea on Pinterest but sorry I can’t figure out who to give the credit to since I can’t find the link) but I recreated the chart! There are several variations but my chart added the dates for each week in 2015. Some charts begin with Week 1 to save $1.00 but I like the reverse method because you seem to have a little more ‘surplus/free’ cash towards the end and beginning of the year with Holiday cash gifts received, work bonuses/raises and even tax returns! Last year, I used a large mason far and just shoved all my cash in it. But this year, I decided I’ll be opening up a separate online high-yield savings account and will be transferring the funds weekly into this account. I figured it was the best way from ‘breaking the piggy bank’ as it does take a couple days to withdraw funds from these accounts so I think twice on requesting the withdrawal. Now, start with Week 1 and save $52.00, the following week you save $1.00 less than the week before and so forth. Now, if $52.00 seems a lot for the week, think about all the unnecessary expenses you do throughout the week like Starbucks runs, junk food, taxis rides, those bagel (talking to you New Yorkers! ), etc. The first month will be tough but after January is done, think about it, you already have $202.00 saved! Not bad! Here’s the chart below and wish everyone lots of luck and discipline throughout the year! Happy Savings! Post in the comments below on and let me know how you’re doing! Good bye 2014 and Hello 2015!! I love this idea and think i may start this in addition to other goal using this as my base savings plan. Glad this idea inspires yoj to save money!!! Whoohoo! Thanks for sharing Nakia!